My Dad has been visiting this weekend. The last time I made my Dad a cheesecake it was a bit of a disaster (forever to be known as the baked rhubarb omelette incident). I’m happy to say today’s cheesecake was much more a success. This was meant to be a Ferrero Rocher cheesecake from May’s issue of Good Food magazine. Off we went to the brand new Waitrose near us (I am worried by just how excited I was in there – they have a patisserie and you get a free coffee – what more could you want?) to purchase the ingredients. After purchasing most of the ingredients we then went to the local greengrocers where we bought a huge box of strawberries for a pound. It was then decided that perhaps a strawberry cheesecake would be a better use of ingredients. After a quick trawl of the Internet I found this recipe on the Baking Mad website for a white chocolate and strawberry cheesecake. 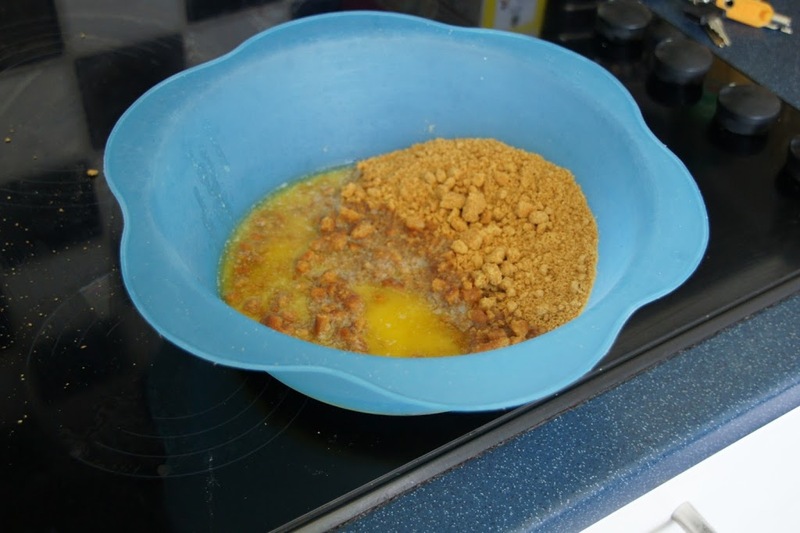 This recipe will serve 12 and needs a 20cm or 23cm springform tin. It’s easy to make and doesn’t take too long (I managed to make it in about an hour). It does take a while to chill (minimum 4 hours – overnight is ideal) so it will need to be made in advance. Our friends Simon & Louisa came round for lunch today (accompanied by their super cute son Finn). Following on from my carrot cake post where I was using up some carrots I was given at work I also had some pears that needed using. 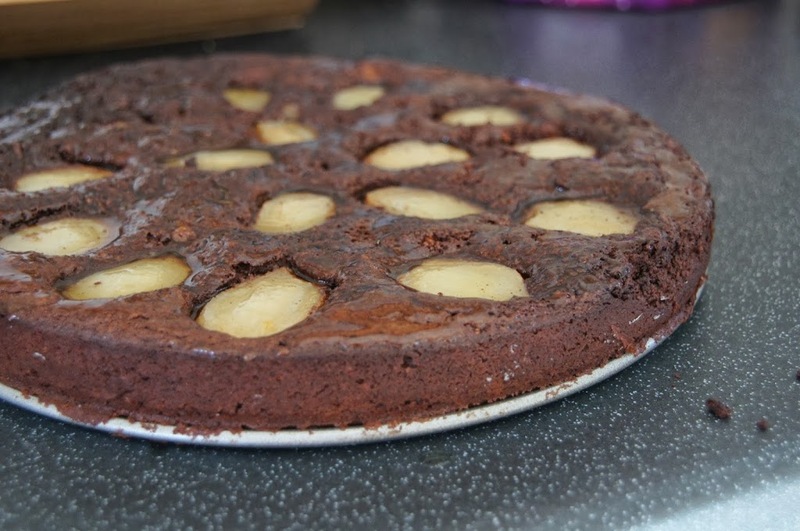 I decided to opt for Jo Wheatley’s Chocolate & Pear Torte from her ‘Home Baking’ book. You can find the recipe online here. 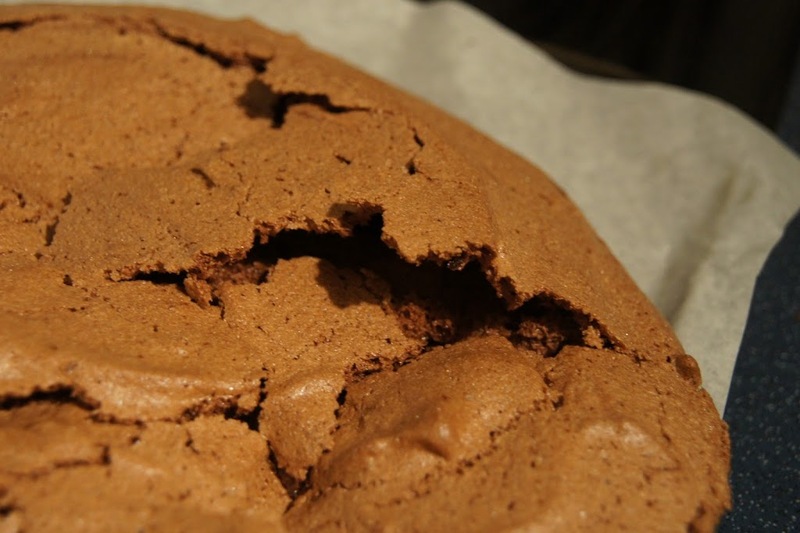 I had considered this BBC Good Food flourless chocolate and pear cake and this BBC Good Food squidgy pear and hazelnut spread cake but I find Jo’s recipes easy to follow and that they produce good results. This torte will serve 8-10. 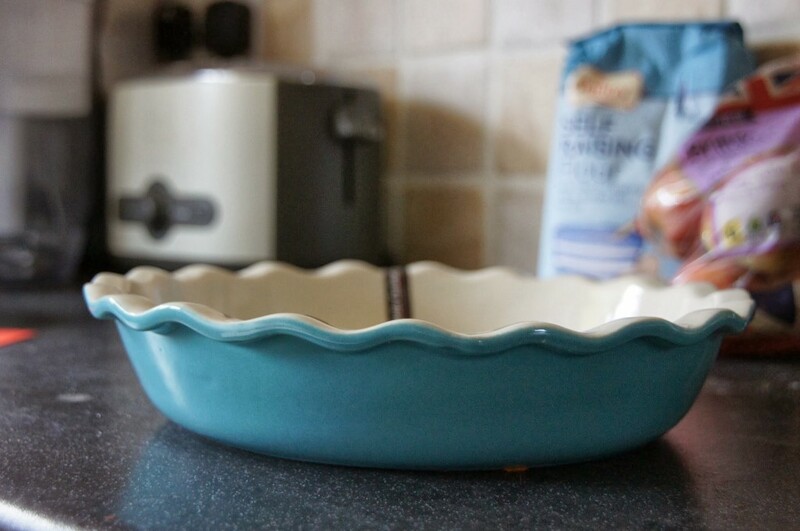 You will need a 25cm springform or loose-bottomed cake tin that you have lightly greased. 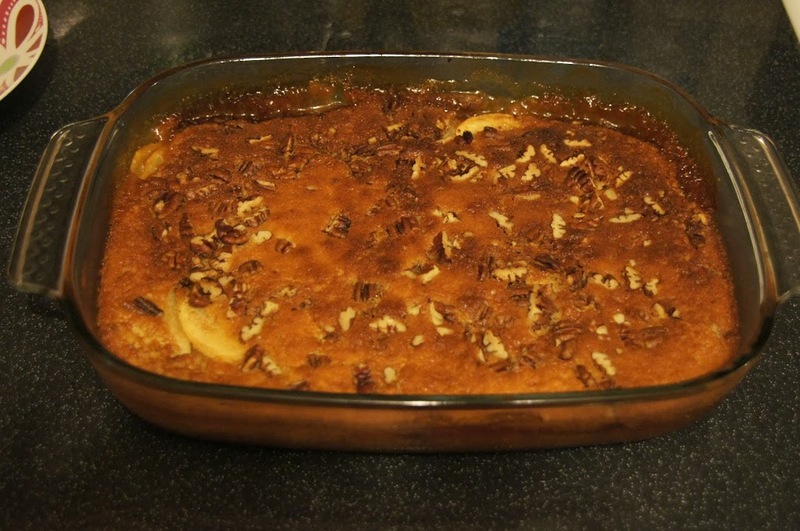 This weekend has definitely been a weekend for a comforting, warming dessert. I tried making this recipe a couple of months ago but failed as I a) didn’t read the recipe carefully enough and didn’t realise just how long it would take and b) didn’t own a suitable dish to make it in. The dish situation was rectified through the Marks and Spencer’s sale where I purchased a shiny new dish with a lid. 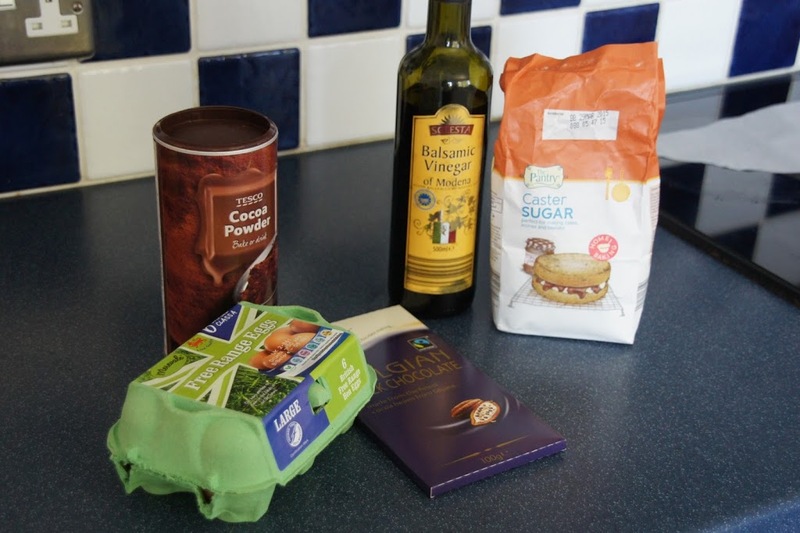 Be warned – the pudding needs a long time to cook (just under 4 hours) so you will need to plan and prepare ahead! It is easy to prepare and doesn’t require a lot of attention. 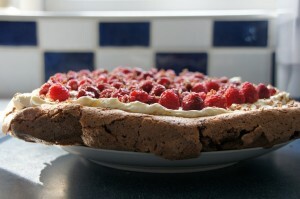 This is a Jo Wheatley recipe from her ‘Home Baking’ book and serves 6-8. You will need a round glass dish (Pyrex or similar) 18cm wide and 8cm deep with a lid (my dish was a little bigger than this). Christmas is a time for catching up with your favourite people which is just what we did yesterday afternoon. We went for a pre-Christmas lunch at our friends Simon and Louisa’s yesterday and I offered to make dessert. 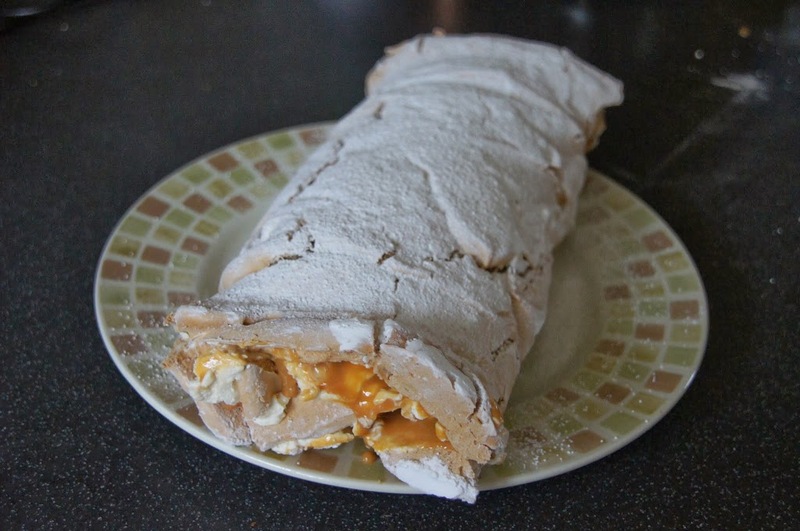 After much trawling the Internet I decided upon a toffee pecan roulade. It’s a popular dessert at this time of year – if you Google it you will find all the major supermarkets offer their own version.This is a recipe by Ruth Clemens that you can find on her Pink Whisk website here. I’ve only ever made a roulade once before (this chocolate and cranberry one) so I’m not really an expert. I was in a bit of a rush yesterday and didn’t have a big enough tin so it ended up as more of a flat rather than circular roulade. The meringue was also quite chewy – I don’t think I cooked it for long enough. It did taste good though – you can’t really go wrong with toffee and cream can you? I would definitely make this again and would highly recommend it for your Christmas festivities. A bonus is that it is also suitable for freezing. We are big Aldi fans in the Little Birdie household. Their fruit and vegetables are cheap and good quality. So when Mr Birdie spotted some bargainous Bramley apples over the weekend (4 for 99p) I decided it was time to make an apple-based pudding. After some investigation work I found this BBC Good Food recipe for toffee apple pudding which looked easy enough and I had all the ingredients for. I did consider making this treacle apple pudding, especially as I have pudding basin that I have used yet but opted for ease instead! Although this dessert isn’t a ‘looker’ it was tasty and went down well after dinner on Sunday. Autumn has well and truly arrived. The weather on Sunday was horrible and it was decided in the Little Birdie household that it was most definitely crumble weather. It was a proud day as it was the first time we picked apples from our apple tree to use in the crumble. It has been in the garden for just over a year and was only a cheap tree from Aldi so we have been impressed that anything has grown. The blackberries were also freshly picked from just behind our house so the filling came from less than 20 metres from our kitchen – an impressive feat! We are disappointed that we will have to leave it when we move house this week. This is a Jamie Oliver recipe from his ‘The Naked Chef’ book. 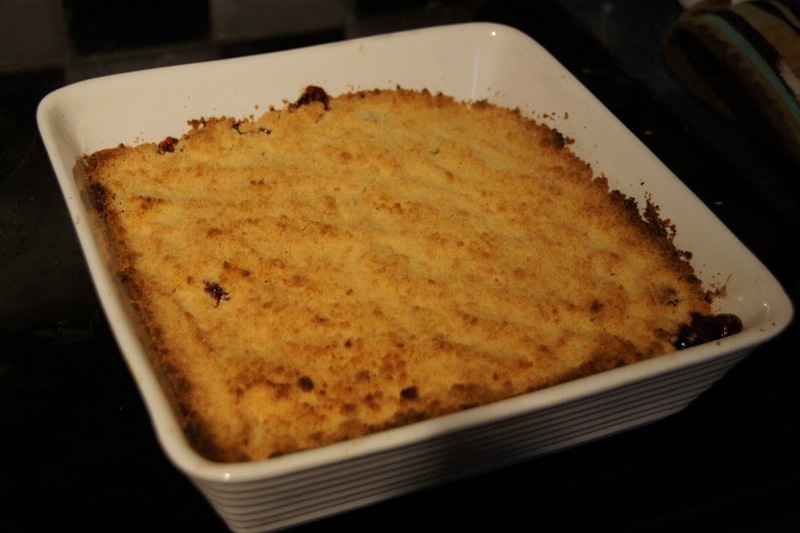 It is my go to crumble recipe that always goes down well. You can use any fruit or combination of fruit that you want. Apples, pears, berries, plums, peaches, rhubarb – the possibilities are endless. Summer has finally arrived and it is barbecue season. Our friends Simon and Louisa (and their super cute son Finn) joined us this afternoon for a barbecue in the sunshine and to cheer Andy Murray on (well done Andy!) 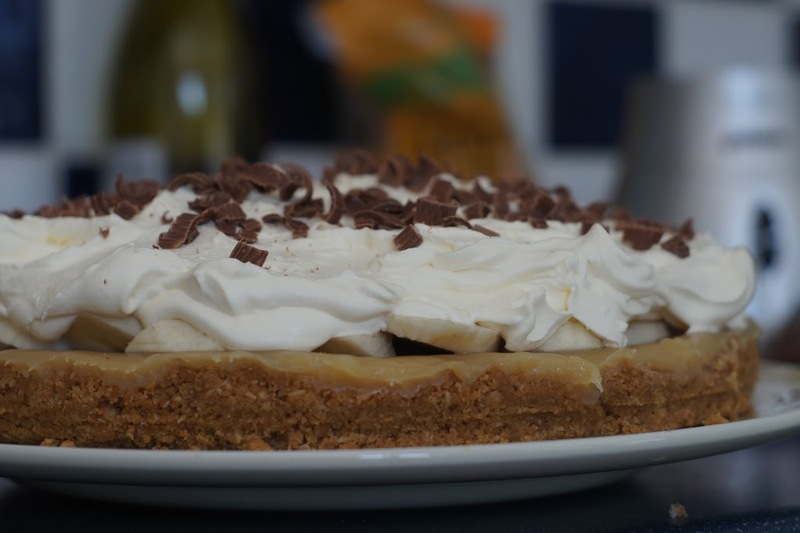 I was tempted to make Nigella’s Forgotten Pudding or her Strawberry Shortcakes but Mr Birdie requested banoffee pie so banoffee pie it was! There are hundreds of recipes for banoffee pie on the Internet. 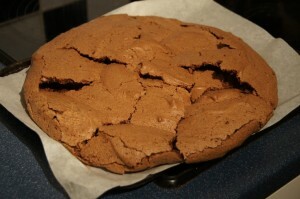 After much perusing I opted for a Hairy Biker’s recipe from the BBC website which you can find here. 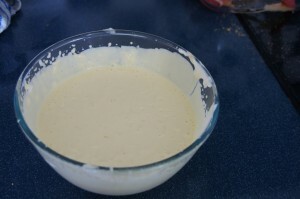 I made some changes such as not putting banana in the cream on top and not putting any banana on the top. 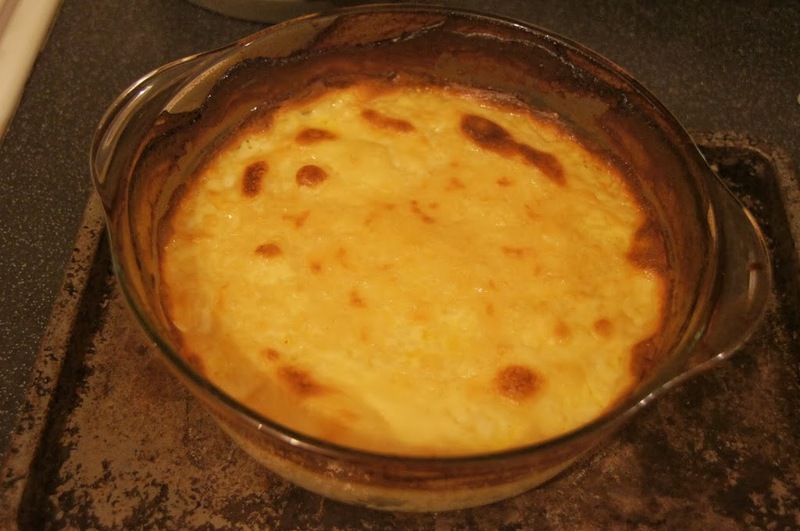 It is a simple recipe and it is super tasty. After a few baking disasters recently I was happy to get back on track and enjoy some baking success! Apologies that it has been a little quiet on the blog – I didn’t realise it was over a month since I had last posted. Our weekends have been hectic due to concerts, babysitting, barbecues and tidying and packing for our forthcoming house move (fingers crossed). Today is Father’s Day so happy Father’s Day to any dads reading the blog – I hope you are enjoying your day. My Dad is coming to visit so it was desert making time yesterday. My Dad is a big fan of cheesecake so I decided this was the obvious choice. I am big fan of rhubarb (which is currently 69p in Aldi as part of their ‘Super Six’ offer – bargain!) and picked some up during our weekly shop and decided it was time to combine the two. I did consider trifle but I don’t have a trifle bowl. 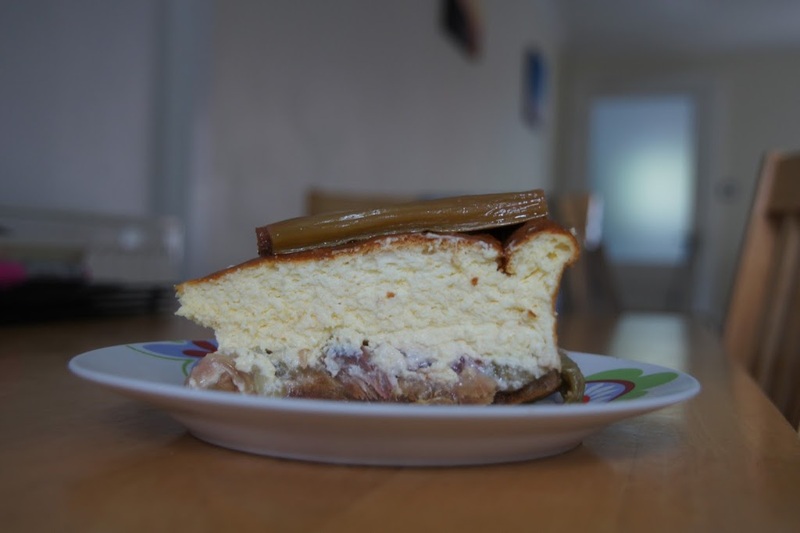 I originally found a Delicious Magazine recipe for a baked rhubarb and orange cheesecake which looked good but served 12-16 and required 900g of cream-cheese which seemed a little extravagant for just three people! 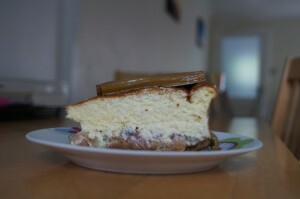 I found a recipe on the BBC website for a baked rhubarb and ginger cheesecake that served 8 and seemed a little less extravagant. You can find the recipe here although as you will see I’m not sure this is necessarily a recipe I would recommend! 1) Preheat the oven to 200C/400F/Gas 6. 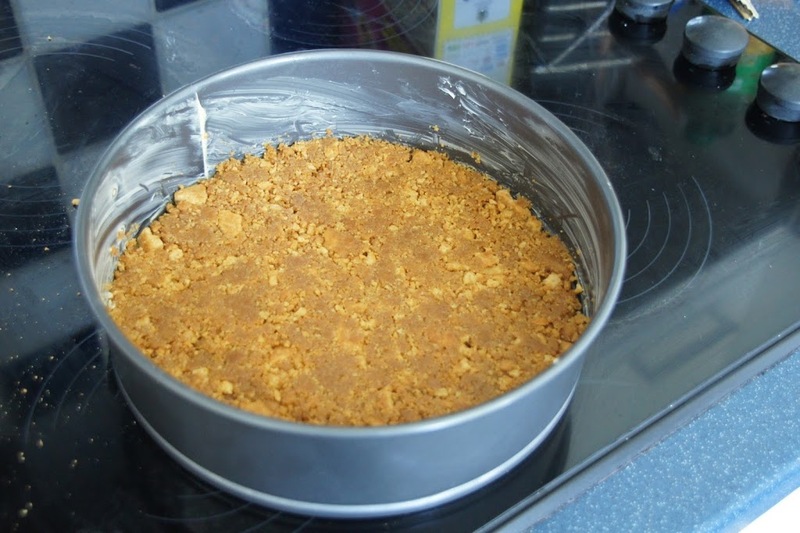 Grease and line and 25cm/10in loose-bottomed cake tin. 2) Cut two thirds (1kg) of the rhubarb into pieces about 5cm/2in long, place in an ovenproof dish and sprinkle with 55g of the caster sugar. Roast in the oven for 20 minutes or until tender. 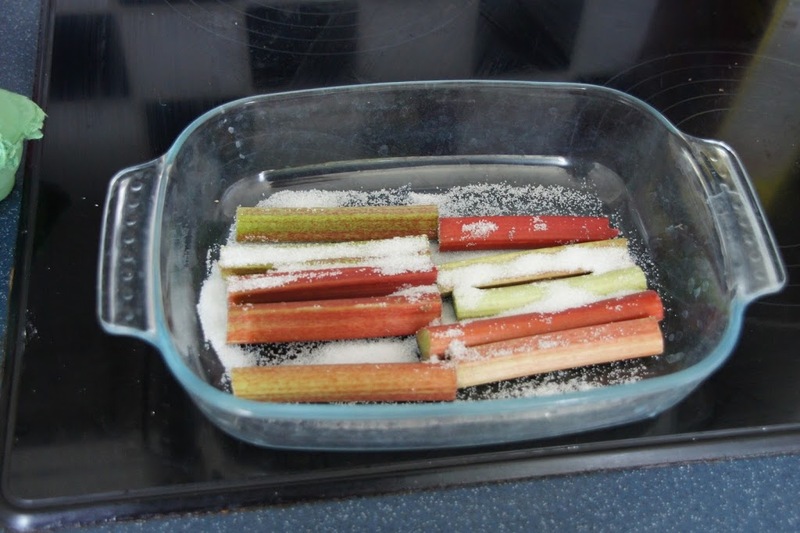 3) Meanwhile, cut the remaining rhubarb into pieces about 7.5cm/3in long, place in another ovenproof dish with a tablespoon of the caster sugar and roast until just tender but still holding their shape. Set aside to decorate the cheesecake. 5) Beat the cream cheese with the remaining 125g caster sugar and the lemon zest, then add the soured cream and egg yolks and beat until smooth. 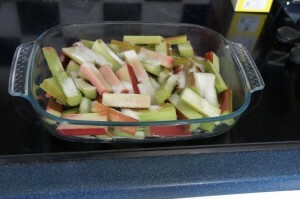 6) Spread the rhubarb onto the chilled biscuit base (if you’ve remembered to chill it!) Whisk the egg whites until they hold soft peaks then fold into the cheese mixture and pour on top of the rhubarb. 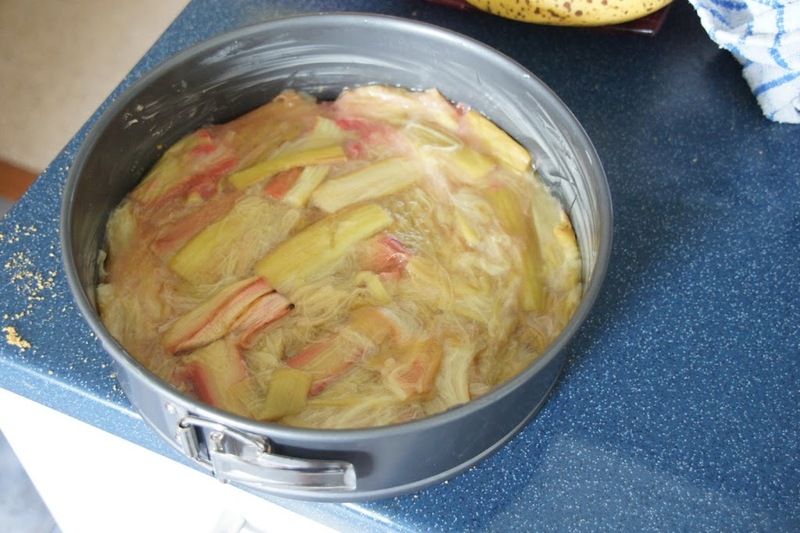 My rhubarb after it baked was quite watery. In hindsight I think I would have benefited from trying to drain some of the liquid away as the base of the cheesecake was very watery and leaked during baking and afterwards. I also didn’t use all the rhubarb as otherwise the tin would have been half full before add the mixture. 7) Bake in the oven for about one hour, reducing the heat to 180C/350F/Gas 4 once the cheesecake has risen. The top should be firm to the touch but still slightly wobbly. Leave the cheesecake to cool then remove it from the tin. The baking is where it all went wrong. It dramatically rose (it resembled more of a souffle than a cheesecake) and formed a not so nice layer/crust on the top. It did sink as it cooled down but the texture was not nice (Mr Birdie called it a rhubarb omelette rather than a cheesecake!) After it came out of the tin it looked hideous so that’s why there are no photos of the whole thing – it really did look disastrous. I decided to leave it in the fridge overnight to see what state it was in the next day. 8) Arrange the reserved rhubarb on top and dust with the icing sugar. As you can see it wasn’t too bad in the end – I managed to salvage three slices for lunch today. 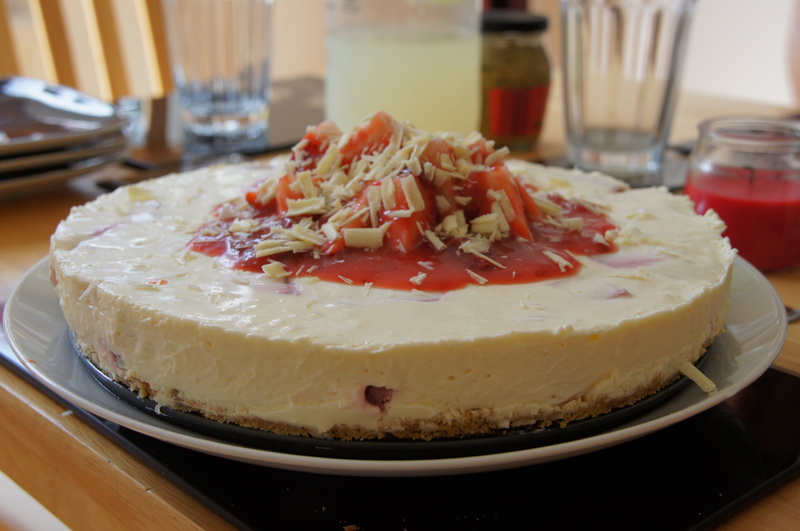 I think if I try a rhubarb cheesecake again I will investigate one that mixes the fruit with the cheese. 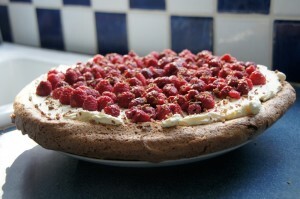 We had our friends Emma and John over for Sunday lunch today so it was time to try a new dessert. The lovely Emma is pregnant so that meant cheesecake was out. 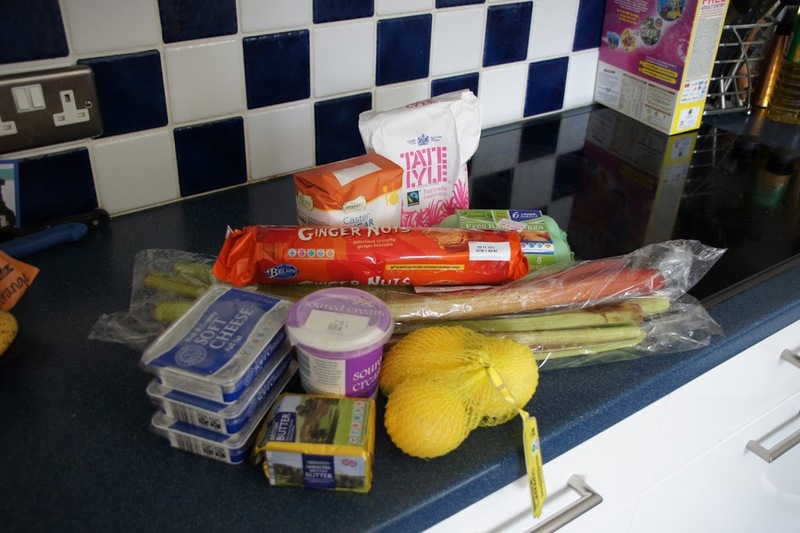 I am a bit scared of tarts (pastry – eek!) so decided that following the success of my previous pavlova it was time to try a different pavlova. I have been wanting to try Nigella’s cappuccino pavlova that featured in her Nigellissima Christmas special last year (you can find the recipe on the BBC website here or on her website here) but decided that as the sun was shining maybe something a little bit more summery/spring-like was required. After a bit of research I found Nigella’s recipe for chocolate raspberry pavlova and decided that this was the recipe to try. It’s from her Forever Summer book and can be found on her website here. 3) Beat in the caster sugar a spoonful at a time until the meringue is stiff and shiny. Sprinkle over the cocoa, vinegar and the chopped chocolate and carefully fold in. 5) Place in the oven, then immediately turn the temperature down to 150C/ gas mark 2 and cook for about 1 – 1 1/4 hours. 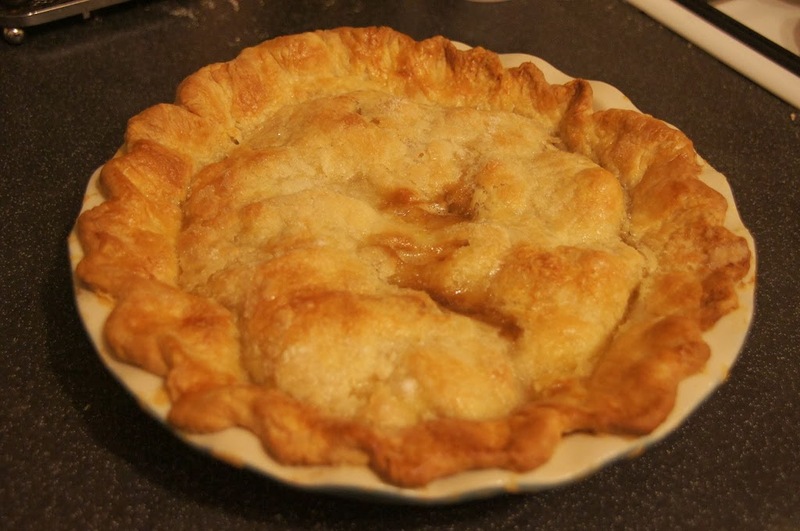 When it’s ready it should look crisp round the edges and on the sides and be dry on top. When you prod the centre it should feel slightly squidgy. 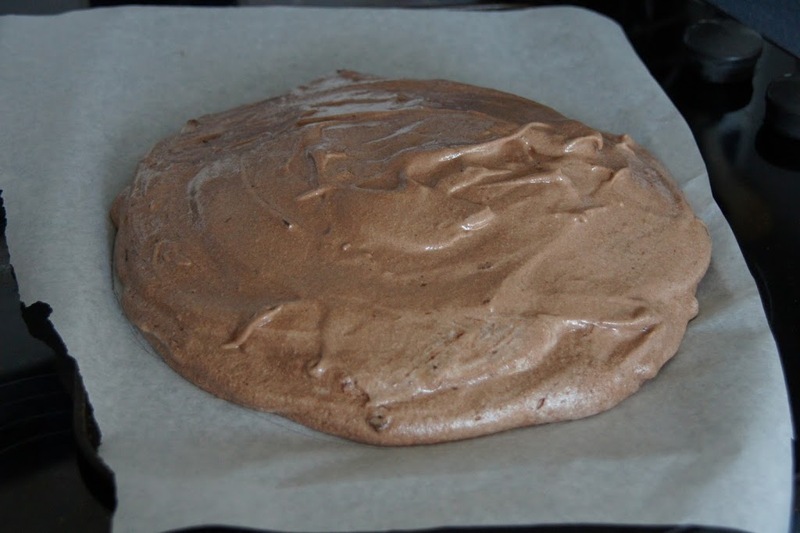 Turn off the oven, leave the door slightly open and leave the meringue to cool completely. As you can see I had some serious cracking issues. I’m not sure what I am doing wrong but I have had this problem twice now – it was cracking during the cooking rather than afterwards. I thought that it might fall apart completely but luckily it held together. If anyone can shed any light on why I am such major cracking issues I’d be very grateful! 6) When you’re ready to serve, invert it onto a large plate (ideally flat-bottomed). 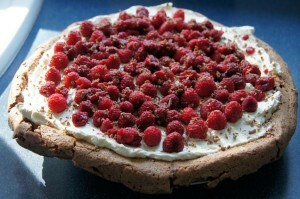 Whisk the cream until thick but still soft and pile it on top of the meringue, then scatter over the raspberries. 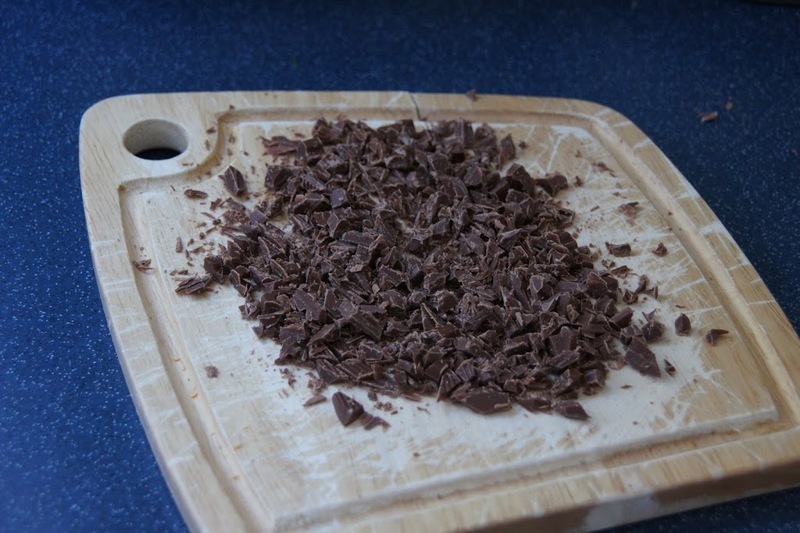 Coarsely grate the chocolate over the top and sprinkle over. 7) Enjoy! It is delicious and was a big hit. The meringue is chewy and the cream and raspberries are the perfect topping. I would definitely recommend and make this again.